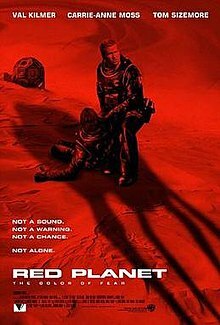 Red Planet is a 2000 science fiction thriller film directed by Antony Hoffman, starring Val Kilmer, Carrie-Anne Moss and Tom Sizemore. Released on November 10, 2000, it was a critical and commercial failure. The film was Hoffman's only feature film; he primarily directed television commercials. In 2056 A.D., Earth is in ecological crisis as a consequence of pollution and overpopulation. Automated interplanetary missions have been seeding Mars with atmosphere-producing algae as the first stage of terraforming the planet. When the oxygen quantity produced by the algae is inexplicably reduced, the crew of Mars-1 investigate—a crew consisting of Quinn Burchenal (Tom Sizemore), a geneticist; Bud Chantilas (Terence Stamp), an aging philosophical scientist and surgeon; systems engineer Robby Gallagher (Val Kilmer); commander Kate Bowman (Carrie-Anne Moss); pilot Ted Santen (Benjamin Bratt); and terraforming scientist Chip Pettengill (Simon Baker). When Mars-1 is damaged in arrival by a gamma-ray burst, Bowman remains aboard for repair while the others land to locate an automated habitat (HAB 1) established earlier to manufacture food and oxygen. During insertion, the team's landing craft is damaged and lands off-course. In the aftermath, "AMEE" (Autonomous Mapping Exploration and Evasion)—a military robot programmed to guide them—is lost, and Chantilas suffers a ruptured spleen and internal bleeding, and tells the others to leave him behind. Santen refuses, but Chantilas tells them that they have limited oxygen left to make it to HAB 1. Chantilas tells Gallagher that it is all right, as he got to see Mars for the first time. The crew leaves to allow Chantilas to die in peace. In orbit around Mars, Bowman contacts Houston, which informs her that Mars-1 is in decaying orbit, but offers hope of restoring engine function in departing Mars. On Mars, the landing party find HAB 1 mysteriously destroyed. They are baffled for an explanation, since the module was designed and field-tested in Tornado Alley to withstand any damaging storms on Mars. All expect their imminent deaths by suffocation. Pettengill and Santen wander from the others to explore, later to reach a canyon where Pettengill accidentally kills Santen, after they get into a fight over whether or not the mission was a failure, and that Pettengill realizes that Santen would never accept defeat. Pettengill returns to Burchenal and Gallagher, and tells them that Santen killed himself. His oxygen depleted, Gallagher opens his helmet, choosing a quick death over asphyxiation – and discovers that Mars' atmosphere is thin but breathable. The only salvageable material from the habitat is all of the liquid fuel, which has ruptured out of its containers but pooled under the wreck. With no remaining power in their suits, the astronauts set it on fire with a flare so they can have a bonfire to survive the massive temperature drop of the Martian night. AMEE reunites with the crew, and the three astronauts notice the robot is damaged and attempt to shut it down so they can recover its guidance device. Perceiving their actions as a threat, AMEE breaks Burchenal's ribs and pursues the others before retreating. Gallagher tells the others she has gone into military mode, and intends to kill them all one by one. She wounded Burchenal instead of killing him because she has been programmed with knowledge of the old guerrilla tactic that a wounded man will slow the enemy down since effort must be expended to transport a wounded teammate. Eventually, Gallagher builds a makeshift radio from parts of the Mars Rover Pathfinder, through which Bowman instructs them to use a Russian probe's sample-return system to launch themselves into orbit. During the trip, Bowman tells Gallagher that the probe can hold only two people. The trio takes shelter from an ice storm inside of a cave. Devastated by the recent news and afraid of being left behind, Pettengill flees with the radio, only to be killed by AMEE. After the storm subsides Gallagher and Burchenal recover the radio from Pettingill's corpse, and discover that it has become infested by insect-like native Martian life (identified by Burchenal as "nematodes"). The insects are highly flammable, as using a simple cutting torch on Pettengill's corpse to free his grip caused a chain reaction, making all of the insects in his corpse explode like firecrackers. Later, the two encounter a field of algae being eaten by the insects, and Burchenal pieces together what happened. The Martian insects had lain dormant on their almost dead world, but when the probes from Earth spread algae fields across Mars it gave them a massive new food source and led to a population explosion. The Martian insects are what caused the algae to disappear, but in the process they actually gave Mars breathable oxygen levels, because they produce oxygen as a waste product (explaining why they are so flammable). The insects are also what destroyed the habitat module, as they tore in to get to the food supplies inside. Burchenal explains to Gallagher that the biochemistry of alien insects' respiratory metabolism is capable of producing oxygen far more efficiently than human science is currently able to. Studying the insects' biochemistry is the key to terraforming Mars, and may even lead to discoveries which will allow Earth's polluted atmosphere to be repaired. However, Burchenal is attacked by swarms of the insects when blood drips from an open wound. Rather than be eaten alive, he passes his sample vial of insects to Gallagher before immolating himself and his attackers. Gallagher reaches the Russian probe, finds sufficient fuel to power the rocket's engine, but not enough electrical power to launch the probe, and realizes that the only available replacement is AMEE's power core. In a final confrontation, Gallagher is able to lure AMEE into a trap and disable her using one of the probe's sample launchers, then takes her battery. Gallagher launches himself in the probe's sample-return capsule and reaches orbit where Mars-1 is waiting for him, and he is recovered and revived by Bowman. Gallagher becomes upset that four astronauts died so that he could live, but Bowman tells him that they did not die for nothing. The computer is busy analyzing the sample of Martian insects which Gallagher brought back, and research on them might lead to repairing Earth itself. With a six-month-long trip back to Earth, the computer has plenty of time to analyze the insects, and Bowman and Gallagher have time to start pursuing a romantic relationship. The production of the film (which was filmed in Wadi Rum in Southern Jordan and in outback Australia) was the subject of numerous reports about the fractious relationship between co-stars Tom Sizemore and Val Kilmer. Kilmer's reputation for being "difficult" was already well-established, and although the two stars had been friends, they fell out after Kilmer reportedly became enraged when he discovered that production had paid for Sizemore’s exercise machine to be shipped to the set. Kilmer shouted, “I’m making ten million on this; you’re only making two”, to which Sizemore responded by throwing a 50-pound weight at Kilmer (which missed). The two were soon refusing to speak to each other or even come onto the set if the other was present, necessitating the use of body doubles to shoot scenes involving both actors, and their relationship became so bad that one of the producers is said to have asked Sizemore not to hit Kilmer in the face when the big fight finally happened - in the event, Sizemore cooperatively landed a knock-down blow on Kilmer’s chest. Sizemore has since described the film as one of his career regrets, but also stated that he and Kilmer have since reconciled. Red Planet opened at No. 5 at the North American box office making $8.7 million USD in its opening weekend. The film was a box office bomb, grossing $33 million worldwide against an estimated budget of $80 million. The film received negative reviews, with only a 14% "rotten" rating on Rotten Tomatoes based on 100 reviews. Stephen Holden's review in The New York Times was almost entirely negative, calling the film "a leaden, skimpily plotted space-age Outward Bound adventure with vague allegorical aspirations that remain entirely unrealized." The music for Red Planet was composed by New Zealand musician Graeme Revell, with performances from French singer Emma Shapplin. ^ "Film Distribution - Village Roadshow Limited". Village Roadshow Pictures. 11 February 2014. Archived from the original on 25 February 2014. Retrieved 11 February 2014. ^ Connelly, Sherryl (17 March 2014). "Action star Tom Sizemore recounts his rise and fall from fame and his battle with sobriety in new memoir". New York Daily News. Retrieved 28 February 2016. ^ Stern, Marlow (26 September 2014). "Tom Sizemore's Revenge: On Tom Cruise's Scientology Recruitment, Drugs, and Craving a Comeback". The Daily Beast. Retrieved 28 February 2016. ^ "Red Planet (2000) - Box Office Mojo". www.boxofficemojo.com. This page was last edited on 19 April 2019, at 02:07 (UTC).